Success of the expedition commemorating regaining independence by Poland. A month of struggles, 3 unclimbed peaks and new, Polish paths – with such achievements, the climbing expedition, which was operating in the high mountains of Pakistan on the occasion of celebrating the centenary of Poland’s regaining independence in 1918, ended up this adventure. The expedition turned out to be a great success. Undoubtedly, these feats will be recorded both in the history of alpinism and in the memory of each participant. 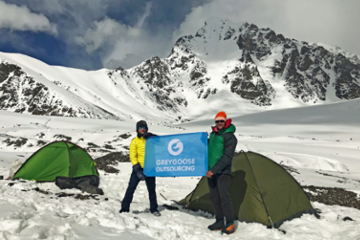 We, as Greygoose Outsourcing, are proud to be the main sponsor of this expedition. Moreover, our CEO of the company took an active part in this event. The group which set off to Karakorum consisting of 9 Polish climbers (Tomasz Hełka, Wiktor Jurasz, Paweł Kułaga, Bogusław Magrel, Anna Migdał, Jan Pecka, Dawid Plewczyński, Monika Szławieniec-Reczuch, Sławomir Wiktor) and 2 Pakistani climbers (Karim Hayat i Rahmat Ullah Baig). The team was accompanied by 35 porters and 7 donkeys. Without being discouraged by the winter weather conditions on the spot, they jointly faced the hardships, thus making their mark on the history of alpinism. Hiking in Karakorum is not the easiest one – this mountain range is one of the most glaciated and exposed to the wind (jet stream) area on the globe. The expedition stayed overnight at altitudes: 3900, 4200 and 4400 m a.s.l., After 4 days of initial trekking they arrived at the altitude 4260m a.s.l., where the base camp was located. Taking advantage of the improving weather conditions, the group decided to climb the ridge, which divided the valleys of Yawash and North Ghidims glaciers. This way, the highest point of the large rock bastion, named in honour of independent Poland – Polish Massife (5360 m a. s. l.), was reached. The original aim of the expedition was to reach the summit of the unclimbed Yawash Sar II. According to the initial assessments its height is 6178 m a.s.l. One of the presumptions was to take official measurements, making use of the technical GPS equipment. Unfortunately, under the wall of Yawash Sar II it turned out that the conditions were too dangerous to risk climbing. Too much snow thus a very high avalanche danger caused the participants to change their original plans. The new target was the neighbouring summit -Two Headed Massife. Finally, after the necessary acclimatisation, on May 31, 2018, at 3:00 am, the climbers set off on their way to Two Headed Massife, and 7 hours later, as the first in the world, they reached the peak of 5700 m a. s. l. The climbing route itself was called “Hunza Freedom” in honour of the hospitable region, from which the Pakistani colleagues came. The first achievement encouraged the group to further territory exploration. After returning to the base camp and a two-day rest, the climbers headed for the next destination, the top of Lal Siran Katethk Sar, 5465 m a. s. l., which was unclimbed. This mountain turned out to be much more difficult in technical terms, steeper and full of falling snow. Climbing took its toll, but the panoramic view of Karakorum from the top of the mountain, including K2 on the horizon, rewarded all the efforts. The road to the top of the beautiful Lal Siran Katetkh Sar, 5465 m a. s. l., was called “Polish Independence 1918”. After two days on the infamous Karakorum Highway, returning to Islamabad, Pakistan’s capital city, Piotr A. Opaliński – Ambassador of the Republic of Poland in Pakistan, who actively supports Polish mountaineers, personally congratulated the members of the expedition before they left the country.